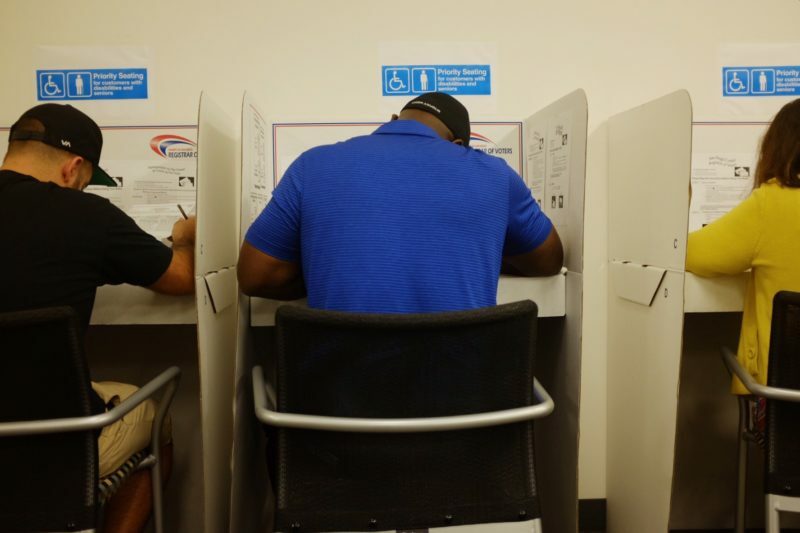 From pot taxes to school bonds to the future of Mission Valley, San Diego voters have a lot of big decisions to make. Here’s a study guide. San Diego voters will see a slew of local measures on their November ballot. We rounded up the major measures – from school bonds and pot taxes to those that would reshape the future of Mission Valley – to help you get up to speed. Consider this your study guide. The goal: The county aims to update its charter to ensure it complies with state and federal law, namely election laws, and properly recognizes the county Fire Authority as an organization that reports to the county’s chief administrative officer. The backstory: One of the most substantive updates would adjust special election timelines so the county can meet legal requirements such as mailing ballots to people serving or living overseas. The only reason the county needs voters to weigh in is because it needs a public vote to update its charter. The county Democratic Party is opposed but hasn’t publicly laid out its case against it. The bottom line: Clean-up ballot measures like these are common, as local governments typically need a public vote to update their charters. The goal: This measure would maintain the county’s longtime practice of setting supervisory district boundaries so at least three include unincorporated areas, and two are dominated by unincorporated areas, during future redistricting processes. The backstory: Every 10 years, the county has to reconsider boundaries for various supervisors districts. This measure would let the county keep setting supervisors’ district boundaries so at least three include unincorporated areas and two are dominated by them. County Supervisors Kristin Gaspar and Dianne Jacob, chair and vice chair of the board, say the language change will preserve what they describe as balanced and equal representation for the more than 500,000 residents who live in the county’s unincorporated areas. At a July hearing, activists raised concerns that the measure could unfairly ensure greater representation for residents of unincorporated areas, and the county Democratic Party later came out against it. Supervisor Ron Roberts, Gaspar and Jacob argue that the change simply codifies current practices. The bottom line: All but one of the county’s supervisorial districts include both urban and unincorporated areas, and two districts – those now represented by longtime Supervisors Bill Horn and Jacob – cover predominantly unincorporated communities. This measure would guarantee that remains the case. The goal: The county proposes amending its charter to ensure that a fund created to help the county cover larger-than-expected pension bills only be tapped for pension needs, and to bar using money tied to long-term debts to fund operations or ongoing needs. The backstory: The county’s long been known for its fiscal conservatism. But 16 years ago it enhanced pension benefits by 50 percent for its employees and began having to make major payments each year to vastly expand its pension assets. It even borrowed money to invest it in the retirement account. The new fund is meant to protect the county’s operation if any of these payments suddenly grow in coming years. The county Democratic Party opposes this measure. The party hasn’t publicly made a case against it but progressives have often criticized the county for hoarding money in its reserve accounts and refusing to invest much of that cash in services and needs. The bottom line: As pension bills rise, San Diego County and cities countywide have struggled to pay. This measure aims to protect funds the county has built up to help cover its bills so they aren’t raided for other purposes – particularly when long-sitting, fiscally conservative supervisors are replaced by newcomers over the next few years. Those newcomers may have some thoughts, but they haven’t weighed in yet. The goal: This ballot measure, pushed by state Assemblyman Todd Gloria and other progressives, would force county candidates to run in general elections rather than allow candidates to win outright in the primary, when fewer people vote. The largest union of county workers helped fund the signature-gathering effort to place this measure on the ballot. This change would bolster Democrats’ chances of winning control of the County Board of Supervisors in 2020 and of prevailing in countywide races such as district attorney over the long haul. The backstory: The county Republican Party and some sitting county supervisors fought the citizens’ measure, pointing out a key error in Gloria’s push at the state level to clear the way for the measure. They’ve also called for more studies of the potential impact of the bill. A judge ultimately decided the measure should be on the November ballot. The bottom line: Republicans see the measure as a clear attempt to bolster Democratic representation in a county long led by Republicans. Democrats, on the other hand, argue it’s best to decide issues and races when the most voters show up to the polls – and they successfully made the same case to city voters two years ago. The goal: La Jolla-based FS Investors wants to redevelop the Qualcomm Stadium property. Its plan emerged amid concerns about the Chargers’ departure. FS Investors is asking voters to force the city to lease the land — along with the Murphy Canyon site of the former Chargers headquarters — to it so it can build an urban district centered on a Major League Soccer expansion team. It’d demolish the current stadium and replace it with a smaller one plus build thousands of homes, retail space and 450 hotel rooms. The group has also committed to provide $20 million to $40 million for a 60-acre river park, although the park that San Diego River Foundation has long wanted isn’t guaranteed by this initiative. Many of the benefits of Measure E — like how much money it would buy and lease the land for, its new promises on a river park and what it would do to accommodate San Diego State University’s land needs — are contained in side agreements backers made with Mayor Kevin Faulconer. For example, the measure calls for the mayor to commission an appraisal of the land. The mayor already got one and proponents accepted it as the price they would base the sales and leases on. Opponents say these agreements aren’t enforceable. The backstory: FS Investors and supporters say voters should support Measure E because it’s privately funded and could help San Diego get an MLS soccer team, a new entertainment district and a river park. They also argue the city will get a better bang for its buck with this one versus the competing SDSU West plan because the city will get to collect lease revenue and property taxes, which SDSU doesn’t pay. While the lion’s share of endorsements have gone to the opposing SDSU West plan, SoccerCity has nabbed two notable backers. They include Mayor Faulconer and Councilman Scott Sherman, who represents the Mission Valley area. Opponents describe the SoccerCity proposal as a land grab that would most benefit the developers behind it. They’ve also noted that San Diego’s not guaranteed to get what FS Investors are promising, and raised traffic concerns. We wrote in detail about how negotiations between SoccerCity and SDSU went and how they fell apart. The bottom line: SoccerCity is one of two options voters are getting to redevelop the Mission Valley area. This one would allow private investors to transform the large plot – and likely far more quickly than the competing plan. The goal: The SDSU West plan would require the city to sell much of the Mission Valley property to San Diego State, meaning the land would remain public and be owned by the state. SDSU has itself produced a plan for what it would do with the land, should it get control of it but the university is not allowed to take a position on Measure G. SDSU has not agreed on a sales price. The measure also says the university would be required to cause to be developed a riverpark should the measure pass. SDSU’s plan for Mission Valley involves replacing the stadium formerly known as Qualcomm with a 35,000-seat stadium. And then, after a series of environmental reviews and campus planning, it would build some amount of student housing, academic buildings, a river park, offices, retail, a hotel and housing. As with the SoccerCity initiative, the city attorney said park plans aren’t guaranteed. The backstory: The SDSU West initiative was basically a response to SoccerCity having too many strings attached to the area SoccerCity supposedly carves out for SDSU. Backers argue the region can get a better long-term economic return on investment by expanding the SDSU campus than by supporting SoccerCity, and praise the environmental reviews and mitigation tied to the plan. This plan’s drawn far more endorsements than the SoccerCity plan. The plan’s long list of endorsers includes Democrats like state Senate President Pro Tem Toni Atkins and Rep. Juan Vargas, Republican City Councilwoman Lorie Zapf and often opposing groups such as the Chamber of Commerce and the San Diego and Imperial Counties Labor Council. Opponents of the SDSU West initiative have raised concerns about how SDSU would pay for its planned developments and argued that the plan could end up lining the pockets of private investors. The bottom line: This Mission Valley redevelopment option would put SDSU in the driver’s seat and prioritize a university expansion that’s likely years away. The goal: This measure, originally proposed by school board member Sharon Whitehurst-Payne, proposes barring future school board members from serving more than three four-year terms. The backstory: This measure is getting far more buzz for what it wouldn’t change. There’s been lots of talk about school board reforms this past year. The City Council has for months debated whether to reform school board elections, which fall under the city’s purview. Council members and advocates discussed a series of potential reforms, including increasing the size of the school board and eliminating at-large elections so that trustees are elected only by the districts they represent. School board members now vie for support from voters in their own subdistricts in the primary and then must campaign citywide in the general election, a costly endeavor that amplifies the importance of union support. In the end, the City Council voted to simply place a term-limit measure on the ballot, overruling Republicans who had pushed for subdistrict-only elections. There’s some lingering frustration about that. The San Diego Union-Tribune’s editorial board even urged a no vote on this measure, in part due to its failure to address the district-only election issue. The city and school district are now facing a lawsuit over their use of citywide elections. A district-funded survey did show support for changes to both term limits and district-only elections though those surveyed showed more support for a two-term limit than the three-term limit being presented to voters. The bottom line: The measure won’t affect current long-sitting school board members and if approved, would take effect in 2020. The goal: This measure would force companies and people doing business with the city to disclose the names and positions of those involved in transactions or contracts with the city. The backstory: More than 25 years ago, San Diego voters approved Proposition E in hopes of requiring these detailed disclosures but a 2016 inewsource investigation revealed those rules weren’t being enforced. City officials have said a lack of specificity in the 1992 ballot measure rendered it unenforceable and agreed to pursue a public vote to change that. So far, no one that we’re aware of has come out against Measure J. The bottom line: If approved, the City Council will receive the names and identities of anyone with more than a 10 percent ownership or contract interest in a proposed deal with the city at least 15 days before voting on new contracts or transactions. The goal: This measure would limit City Council terms to two four-year terms. The backstory: The city’s current rules generally bar City Council members from serving more than two terms. But City Council Democrats Barbara Bry and Chris Ward proposed the measure this spring to remove a loophole that made fellow Councilwoman Lorie Zapf, a Republican, and former Democratic Councilwoman Marti Emerald eligible to serve a third term when their Council districts changed boundaries. There hasn’t been a campaign against this measure. The bottom line: If approved, the change would be effective in 2020, meaning it wouldn’t affect Zapf’s current bid for a third term. The goal: This measure would tie City Council and other elected officials’ salaries to the state judicial salary, eliminate longstanding car allowances and expand restrictions on lobbying and the use of city funds for constituent mailings. The backstory: For 15 years, City Council members have avoided voting to increase their own salaries because, well, doing that tends to anger voters. This measure seeks to give them an out and to tie the salaries for the mayor, city attorney and City Council members to Superior Court judges’ salaries. It would also put the kibosh on controversial car allowances that compensate elected officials for using their own cars, among other changes. City Council members would likely see their salaries rise $75,000 to $120,000 annually in late 2020 while the mayor and city attorney would see their pay increase to nearly $200,000. The mayor now makes about $100,000 annually and the city attorney $185,000. The bottom line: If voters approve it, this measure could end years of hand-wringing about City Council salaries and car allowances. The goal: This measure would allow the city to, as needed, ignore a charter requirement that a screening committee provide a pool of at least two candidates when there’s an open position on the city’s audit committee but a resident who’s already serving remains willing and able to serve on the committee. Basically, the city wouldn’t have to go find a second applicant for the seat if a sitting, qualified member is willing to stick around. The backstory: The city’s independent budget analyst proposed the change to simplify the process of selecting the committee’s three public members. Public members must have at least 10 years’ experience as a certified public accountant, certified internal auditor or have experience working in finance or audit management. The bottom line: This is a noncontroversial clean-up measure to ease the appointment process. The goal: This measure seeks to reinstate a disability benefit for members of the city’s police union who suffer a violent attack that leads to significant mental health challenges, rendering the officer unable to return to normal duty. The backstory: From 2000 to 2010, police union members were eligible for industrial disability retirement benefits after work incidents that led to mental health or nervous system disorders. This benefit has not been offered to officers injured on duty after 2010. City and police union leaders agreed to try to reintroduce the benefit during negotiations for the union’s latest contract with the city. A financial analysis estimated the cost to the city for a claim could be as much as $200,000 a year. The bottom line: The union push to ratify this change on the November ballot is unsurprising at a time when the city’s budget is less strapped and public awareness of mental health challenges following traumatic attacks has grown. The goal: The city of Chula Vista’s got a plan to regulate marijuana and now it’s looking for a way to cover enforcement costs. The backstory: The City Council in February reluctantly approved rules allowing up to 12 marijuana retailers and 10 cultivation businesses. Now it’s asking voters to tax most marijuana retailers and other businesses 5 percent to 15 percent, and to assess a $5 to $25 per square foot tax on cultivation facilities. The bottom line: City officials estimate the tax could generate $6 million a year for enforcement. The goal: Encinitas leaders are asking voters to approve a housing plan that paves the way for more affordable housing in the city. The city’s longtime lack of a plan has made it vulnerable to a state crackdown and lawsuits. The backstory: For years, Encinitas has been in violation of a state law requiring that all cities set plans to provide low-income housing. The Union-Tribune reported in August the city had spent about $900,000 fighting related lawsuits and has been threatened with a moratorium on building or even a forced plan. Now voters are being asked to weigh in on a development plan that would rezone certain properties to allow builders to construct high-density projects there. Many Encinitas residents have issues with the plan. Some say it’s too favorable for developers and fear tall buildings. Supporters say the city needs to act if it wants to avoid punishment from the state. The bottom line: Many Encinitas residents have raised concerns but the drama won’t end if voters reject it in November. The goal: La Mesa leaders propose taxing marijuana businesses to help cover the city’s costs to regulate those businesses. The backstory: Two years ago, La Mesa voters approved a measure allowing pot businesses to operate in the city. The City Council voted unanimously to ask voters to consider taxing businesses that cultivate marijuana indoors at least $7 a square foot of growing space, and 4 to 6 percent of gross receipts for retail businesses selling for non-medicinal purposes. The bottom line: City leaders hope to pull in an additional $2 million annually. The goal: A coalition of community groups wants to cap annual rent increases in the city at 5 percent. The backstory: The National City Families for Fair Rent coalition gathered signatures to force a public vote on this measure, which would also bar evictions that lack specific reasoning and establish a five-member rent control board to enforce the new rules. In May, the city sued to try to keep the measure off the ballot, claiming it would be unenforceable and could violate state law. The city later pulled its lawsuit and decided to place the measure on the ballot. Opponents, including the Building Industry Association, have argued the measure could hamper the city’s rental market and housing development. Measure W works within the confines of the Costa-Hawkins Rental Housing Act, which strictly limits the kind of rent control measures cities can enact. Prop. 10, a statewide measure on the November ballot, would repeal Costa-Hawkins. If both are approved, National City would be free to pursue even broader rent-control policies. The bottom line: If voters approve the measure, National City would be the first city in the region to embrace rent control. The goal: The Oceanside City Council is asking voters to approve a half-cent sales tax hike to help fund city services amid an increasing budget crunch. This is a general tax hike, meaning it simply requires majority support to pass. The backstory: Oceanside leaders say they’re struggling to keep up with growing bills. All but one City Council member voted in June to ask voters to consider the tax hike, noting that the city had few alternatives to deal with dipping revenues. They expect the tax could bring in $11 million a year for seven years. The bottom line: If voters sign off, shoppers in the city would see the sales-tax rate increase from 7.75 percent to 8.25 percent. The goal: The Vista City Council has forwarded a trio of measures to voters to regulate and tax marijuana businesses. The backstory: Measure Z, pushed by activists and industry advocates, would allow for up to 11 medical marijuana retailers and impose a 7 percent use tax on their gross receipts. It will compete with City Council-sponsored Measure BB, which would allow up to three sellers to deliver medical marijuana and another two testing labs to operate in the city. Storefront shops would be barred. Measure AA, another City Council-backed measure, would impose other business taxes including a $14 per square foot tax for cultivation operations and business taxes between 3.5 and 10 percent depending on the business type. Delivery services, for example, would pay a 5 percent tax. The bottom line: Vista has historically cracked down on marijuana sales, so the proposed ballot measures represent a major shift for the North County city. The ask: Increase property taxes by $24.50 per $100,000 of assessed value to support a 30-year, $403 million bond for the school district, which operates middle and high schools in Chula Vista, Imperial Beach, National City and San Ysidro. The plan: The district wants to use the $26 million it projects to pull in annually to repair and upgrade aging facilities, expand science and math instruction and improve school safety. The ask: Increase property taxes by $34.58 per $100,000 of assessed value to support a $265 million bond. The plan: The district wants to upgrade school facilities and technology to support math and science education, repair school roofs and plumbing and improve security, among other needs. The ask: Increase property taxes by $60 per $100,000 of assessed home value for 39 years to support a $3.5 billion bond that could end up costing voters nearly $7.5 billion overall. The plan: The district wants to improve school security, upgrade classrooms, repair plumbing and remove lead and asbestos – familiar asks for voters who approved almost identical projects when the district pitched similar measures in years’ past. Indeed, most of the schools the district flagged for unsafe levels of lead in the water the past couple years haven’t received the upgrades promised in previous bond measures. Longtime school board member Kevin Beiser, who is running for re-election this year, defended the list of projects in a recent interview with the Union-Tribune’s editorial board. He argued that facilities with projects included on past bond needs lists have continued to age and degrade, and that additional needs have been identified beyond those laid out in the past. “I believe that what this bond is attempting to do is to fill that remaining need, fill that gap, as well as solve some additional challenges that we’ve identified,” said Beiser, who also noted that the latest bond is the first since the deadly Sandy Hook shooting in 2012 which put the spotlight on the need for school safety upgrades. Still, the district has more than $2 billion in remaining bond money from its two previous bonds it can access. The San Diego County Taxpayers Association has endorsed some school bond measures around the county but has come out against San Diego Unified’s bond, a move that angered two of its own board members. The county Republican Party and a coalition led by radio host Carl DeMaio also opposes the bond. The ask: Increase property taxes by about $33.15 per $100,000 of assessed home value to support a $247 million bond. The plan: The district wants to use the $13 million it projects to pull in annually to repair and upgrade aging facilities, expand science and math instruction and improve school safety, among other needs. The ask: Increase property taxes by $29.25 per $100,000 of assessed value to support a 32-year, $186 million bond. The plan: The district wants to use the $10.4 million it expects to pull in annually to improve neighborhood elementary schools, construct a new school and upgrade aging roofs plus plumbing and electrical systems. The ask: Increase property taxes by $19.68 per $100,000 of assessed value to support an $18 million bond measure for the school district, which operates schools in Imperial Beach, San Ysidro and southern San Diego. The plan: The district wants to use the new cash to repair and expand its preschool facilities and renovate other classrooms. The ask: Increase property taxes by $20 per $100,000 of assessed value to support a $150 million bond for the school district. The plan: The district wants to use the expected $10 million in annual cash to improve school security and technology and make energy efficiency upgrades. It also wants to repair and upgrade school facilities to reduce overcrowding and replace aging plumbing, sewer and electrical systems. The ask: Reauthorize an existing $15.7 million bond and increase property taxes by $30 per $100,000 of assessed valuation. The plan: The district wants to use the eight-year bond to modernize elementary and junior high classrooms. Correction: An earlier version of this post misstated the amount of the Vista school bond. Jesse Marx contributed to this report.